holiday performances by Broadway Stars. 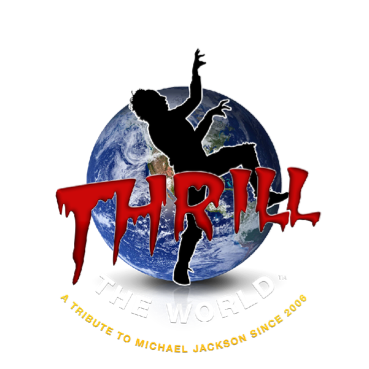 All proceeds from the benefit will go directly to help those with HD and to fund research to find a cure for this dread disease which can strike those carrying the gene at any age, young or old. White Plains Performing Arts Center is dedicated to the presentation and production of a full spectrum of performing arts events for the City of White Plains, Westchester County and the surrounding communities. 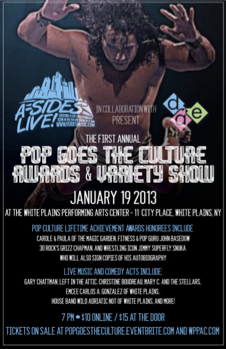 White Plains Performing Arts Center is a 501(c)3 Not-For-Profit Arts Organization. If you appreciate live theatre, we ask you to consider making a tax-deductible donation to WPPAC. Come out and spend a fun filled day with your family and feel good about it! A Portion of the Kids Fair Proceeds Support the H.O.P.E. For Youth Foundation, a 501C3 organization. A day of education and fun for children of all ages and their families. Every booth inside the Kid's Fair has a fun and educational activity! Plus a special performance from Carole and Paula the stars from the Magic Garden! with her critically acclaimed hit Cabaret show "Summer Nights"
Broadway and TV's Ilene Kristen and Josh Franklin. DON’T MISS THIS LAST CHANCE TO SEE THIS HIT SHOW! a truly great evening not to be missed. "Demas reclaims the stage for a true treat; she brings Paula Janis out of the audience with guitar, to afford the two the chance to once again delight audiences .... to the squealing thrill of all the fortysomethings assembled who adore them both." 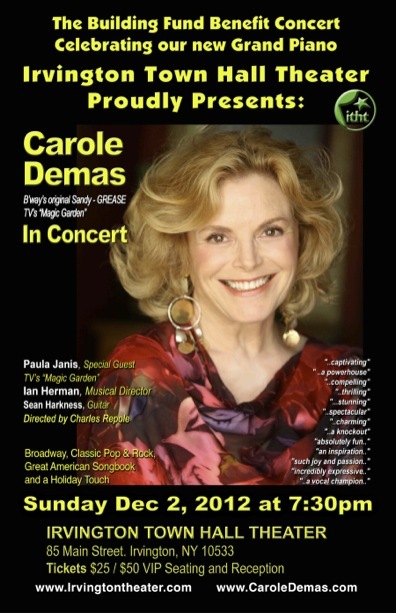 "Carole Demas ….. looking youthful …. and proud of every moment of her long and fulfilling career....."
"The title of her show belies the actual content, which is jam-packed with memories ….."
"Demas’ soprano radiates a softness, with dramatic touches, …and a nostalgic fervor in the simplicity and sweetness …. " 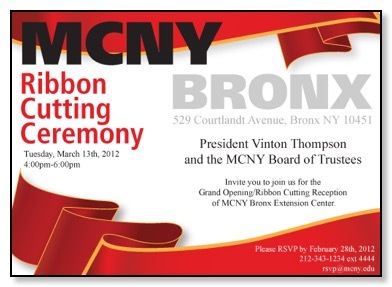 (with)” A special connection and passion ….."
Carole and Paula are honored to take part in a Ribbon Cutting Ceremony for the new Bronx Extension Center of Metropolitan College of New York and to entertain guests attending this ceremony and celebration. .....For more than 40 years, Metropolitan College of New York (MCNY) has cultivated a community of seasoned practitioners at its Manhattan campus in the areas of human services, education, business and public administration. 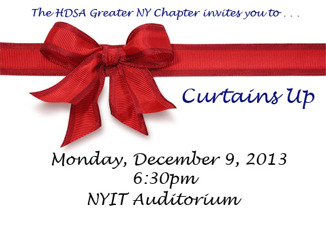 MCNY is proud to now be able to offer a quality education to professionals who work or live in the Bronx and beyond. MCNY will host a special Open House for media, elected officials, prospective students and the community to celebrate the opening of its Bronx Extension Center. .....The MCNY Bronx Extension Center will offer Associate, Bachelor and Master degree programs including an Associate of Arts, Bachelor of Professional Studies in Human Services, Associate of Science, Bachelor of Business Administration in Business or Healthcare Systems Management, Master of Public Administration and a Credentialed Alcohol and Substance Abuse Counseling Program (CASAC). A CLASSIC CHILDREN’S TELEVISION ICON CELEBRATES THE BIG 4-0 WITH YOU! Come see the one and only Carole and Paula, live on stage to celebrate 40 years of timeless music, friendship, stories and laughter! And On-Screen Highlights of favorite Magic Garden moments! Old Fans AND NEW WILL LOVE THIS LIVELY FAMILY SHOW FOR ALL AGES! pose for photos and personally sign DVD’s, CD’s and posters! 2 SHOWS - ALL SOLD OUT!!!! As the Class of ’57 is about to “pass the speed limit,” we invite our classmates, significant others and families to a 55th Anniversary Reunion on the weekend of April 20th, 21st and 22nd, 2012. The centerpiece will be highlights from our Sing performances and there will even be new material. Carole is honored to be a member of the Advisory Board of the new NEW YORK CHILDREN’S THEATRE FESTIVAL!! Exciting new works were selected for the world premiere of the festival and will be very special live theatre experiences for your children (and you). It is all about what children’s theatre can be, quality entertainment for young audiences and a whole lot of fun! Make your reservations and be among the first to enjoy these productions that cannot be seen anywhere else. Three new shows on upcoming weekends. Carole and Paula are delighted to be making a personal appearance at 1pm on Saturday May5th between the 2 performances of The Velveteen Rabbit. You are sure to love this imaginative presentation of a beloved classic with puppets and live actors. Reserve your tickets for the 11am or the 2pm shows and come say hello. 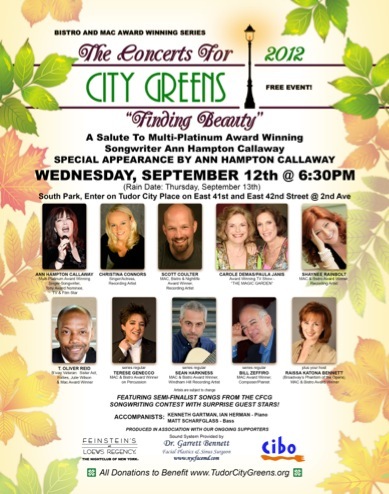 With a special guest appearance by Callaway, “Finding Beauty” stars the singer-actress Christina Connors; the MAC, Bistro and Nightlife award-winner Scott Coulter; The Magic Garden’s Carole Demas & Paula Janis; the MAC and Bistro-winning jazz vocalist Shaynee Rainbolt, and the Julie Wilson Award-winning Broadway veteran T. Oliver Reid. The Broadway veteran (“Christine” PHANTOM OF THE OPERA) and Bistro & MAC Award winning cabaret artist, Raissa Katona Bennett, is the evening’s creator, host and producer. Returning as series regulars are Bennett’s side-kicking drummer -- multiple MAC Bistro Award-winning little big band innovator Terese Genecco; the Windham Hill recording artist Bistro & MAC Award winner Sean Harkness on guitar and the MAC Award winning composer-pianist Bill Zeffiro. The concert’s featured instrumentalists are Kenneth Gartman and Ian Herman on piano, and Matt Scharfglass on bass. Making a special guest appearance to premiere one of the eight semifinalist songs competing in The Concerts for City Greens song writing contest, are Carole Demas (Original “Sandy” in Broadway’s GREASE) & Paula Janis, of the hit TV show, The Magic Garden, who will premiere “Village Green of New York City” by Lauren McCall, a music educator and composer from Georgia. as the afternoon finale of this event. of this wonderful event on the banks of the glorious Hudson River. 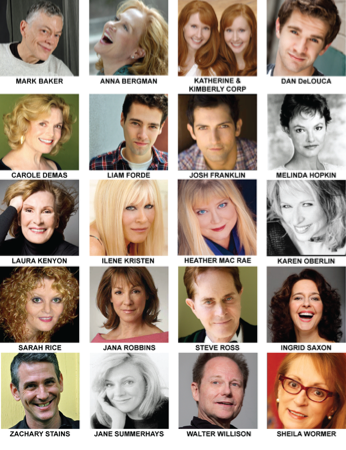 to Benefit the New York Children’s Theatre Festival! of Magic Garden favorite moments! 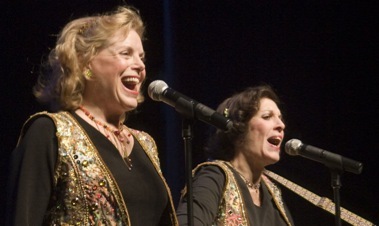 Carole and Paula's songs and stories in New York City. with refreshments, after the show. CD’s and DVD’s will be available for sale. Carole and Paula's songs and stories in Riverhead, New York. 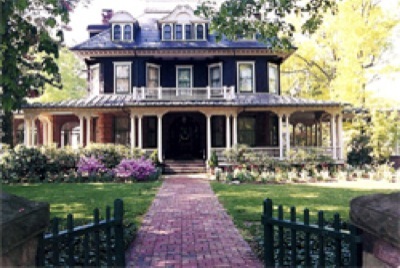 The Riverhead Free Library, the Cutchogue-New Suffolk Library, the Southold Free Library, The Floyd Memorial Library, The Rogers Memorial Library, John Jermain Memorial Library, The Quogue Public Library and the East Hampton Library. To register for admission to this performance, please visit or call one of the participating libraries shown above. 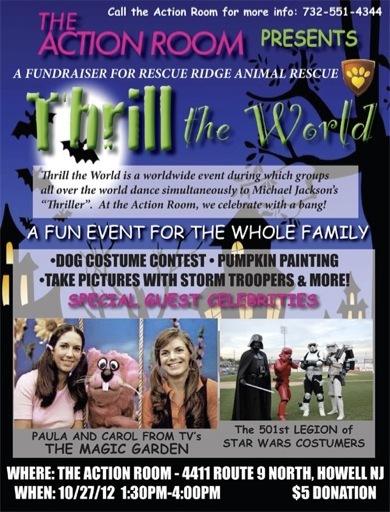 Carole and Paula’s show is a highlight of this colorful, exciting day featuring family fun, a delightful dog costume contest and dancers participating in the international “Thrill the World” Dance Event. Carole and Paula's songs and stories in Howell, New Jersey. “Magic Garden” merchandise available for sale. Carole and Paula will be happy to personally autograph your purchases and pose for photos with you. IT WILL BE RESCHEDULED EARLY NEXT YEAR. and to celebrate the new piano. Pop, Rock and some Holiday touches. A truly great evening, not to be missed. 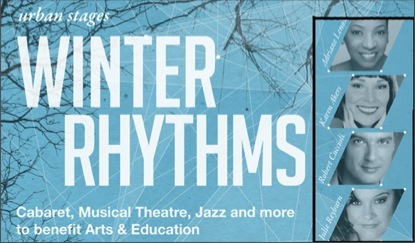 in December and this year’s WINTER RHYTHMS 2012 is certainly no exception. From NAT KING COLE to FRANK SINATRA to DISNEY. From CABARET to ROCK & ROLL to NEW MUSICALS. Urban Stages delivers unforgettable nights with award-winning stars. With 24 shows in 12 nights, the only question is how many are you going to see? A very special celebration of GREASE’s 40th anniversary. The original Broadway cast of Grease will reunite next month for a special 40-year anniversary tribute during the opening number of the 23rd Annual Gypsy of the Year, produced by and benefiting Broadway Cares/Equity Fights AIDS. The rollicking opening number for Gypsy of the Year will feature the original cast of Grease, which opened in Chicago in 1971 before arriving in New York. Among the stars returning to the stage from one of the most popular musicals in Broadway history are Barry Bostwick (Danny), Carole Demas (Sandy), Adrienne Barbeau (Betty Rizzo), Alan Paul (Teen Angel/Johnny Casino) and Walter Bobbie (Roger). Don Billett (Vince Fontaine), James Canning (Doody), Daniel Douglas (Burger Palace Boy), Katie Hanley (Marty), Tom Harris (Eugene), Ilene Kristen (Patty Simcox), Joy Rinaldi (Pink Lady) and Mews Small (Frenchy). Grease, with book, music, and lyrics by Jim Jacobs and Warren Casey, debuted on Broadway at the Broadhurst Theatre, garnered seven Tony Award nominations and played 3,388 Broadway performances before closing April 13, 1980. 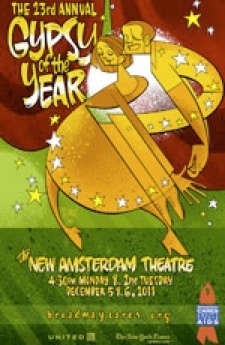 This year's Gypsy of the Year will again be hosted by Broadway personality Seth Rudetsky, host of "Seth's Big Fat Broadway" on Sirius/XM Satellite Radio. The all-singing, all-dancing Gypsy of the Year is easily the biggest party in town with appearances by dozens of Broadway and Off-Broadway's most popular shows and performers. Gypsy of the Year is the culmination of six weeks of intensive fundraising by Broadway, Off-Broadway and national touring companies. It's also a sensational display of the most talented singers and dancers in the ensemble of shows, known as "gypsies." Awards are presented to the top fundraisers and for the best presentation during the two performances. 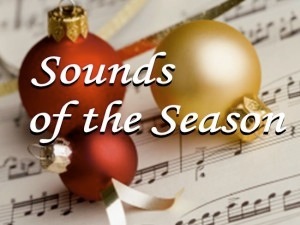 SOUNDS OF THE SEASON, featuring holiday favorites presented by some of the finest vocalists from Broadway and the New York cabaret communities. 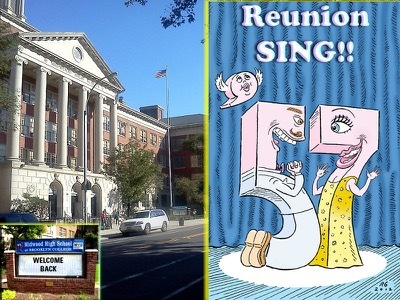 Cast members from Broadway’s Avenue Q, Grease, Kiss Me, Kate, A Little Night Music, Sweeney Todd, Mamma Mia, Threepenny Opera, 42nd Street, Gypsy and others will converge on White Plains for this special holiday happening. classics as well as more contemporary seasonal tunes, accompanied by a swinging trio and performed by some of the most dynamic vocalists in NYC. Included in the cast: Carey Anderson (Mamma Mia, Avenue Q), Carole Demas (Grease’s original Sandy, TV’s The Magic Garden), Eric Michael Gilllett (Kiss Me, Kate, Sweet Smell of Success, The Frogs), Hunter Ryan Herdlicka (A Little Night Music), Sarah Rice (Sweeney Todd’s original Johanna) and Brian Charles Rooney (Threepenny Opera). Further, we’ll be joined by multiple award-winning cabaret vocalists Lisa Asher, Carole J. Bufford, Natalie Douglas, Terese Genecco, Lina Koutrakos, Karen Mack, Colleen McHugh and Gabrielle Stravelli. 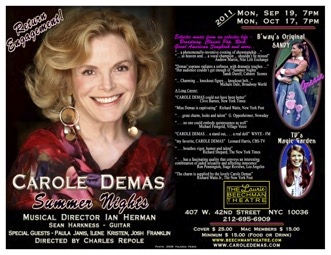 Carole Demas will be joined by her Magic Garden Co-Star, Paula Janis as well. Sounds of the Season is Directed by Phil Geoffrey Bond, with Musical Direction by Avenue Q’s Maryann McSweeney. 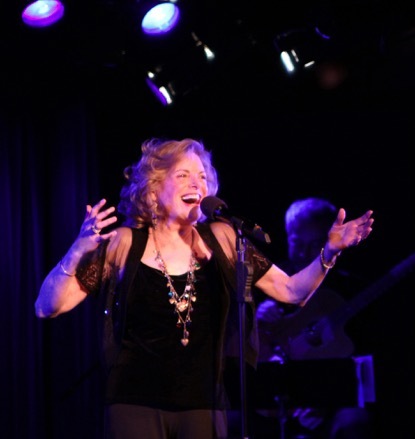 We’re delighted to announce that our very special guest star will be the fabulous LINDA LAVIN! A star of television, film and the Broadway stage, Ms. Lavin will be on hand to share her own favorite tunes of the season, accompanied by acclaimed Musical Director and a celebrated performer in his own right, BILLY STRITCH. AND a special selection of On-Screen Clips from the Original Magic Garden TV programs!! A family show for all ages! A Concert With Live Performance AND On-Screen Magic Garden Memories! Carole's Cabaret Act "One Enchanted Evening"
Carole brings her critically acclaimed show to St. Croix for 1 night only. A Fundraising Benefit for the Caribbean Community Theatre. Broadway, Pop, Rock many of her favorites, a truly great evening not to be missed. Julie Wilson, Carole Demas, et al. a benefit concert to be held on Saturday, May 7 at 4:30pm at Birdland. which will raise funds for Zani's Furry Friends, an animal rescue organization. Julie Wilson, and David Vernon. gives them medical care, and finds adoptive owners for them. The Long Island Music Hall of Fame finally has its own home at a historic building in Port Jefferson. for the building at the site of the former First National Bank Thursday. PLUS a private artists reception is available following.